Calculating harmonicity in relation to the Harmonic SeriesHarmonic Series – The musical pitch of what is perceived as a single note is usually made of many vibrations and resonances whose frequencies are multiples of each other, also called overtones or harmonic series. Harmonic Roots – Some composers, such as the spectralists, have been using the harmonic series a starting point to generate music. This is the reversed process where we start from notes that we already have and then look for the best transposition of the harmonic series. This series can be then used in many ways, for instance for creating related chords. We look for a suitable transposition because in practical use, the harmonic series could have any of the twelve notes as the root or starting note. 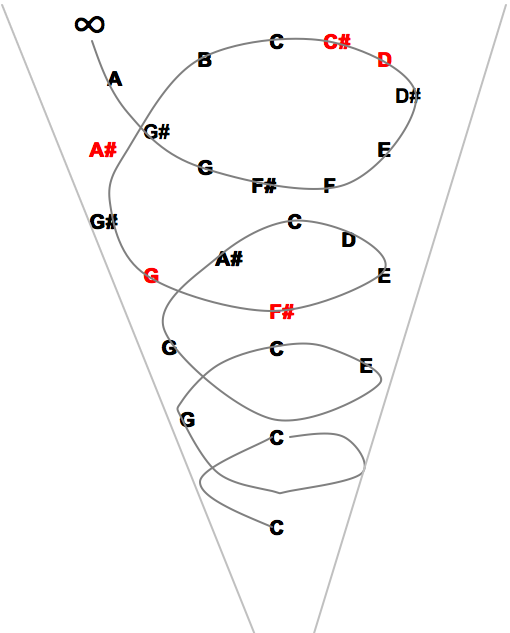 Looking for the root – Imagine the harmonic series like a funnel into which we drop our music notes in order to check how near the root they fit. Out of the twelve possible roots, the best candidate will allow our notes to be aligned with the series in the closest possible position from the root.We obtain an harmonic series that can be used as complement to our chosen group of notes. With that information, we can use the entire twelve tone system (dissonant) with a relative degree of consonance, even though how we use that harmonic series is up to personal choice and practice. Music example – The chords in this example are growing in complexity. They have been deduced from the harmonic series that best matches the melodic pattern. The first chords are simple and consonant, using notes found at the beginning of the harmonic series. The following chords more and more complex, using further notes from the series. We could go further and use any note, as represented by the infinite sign above the spiral. In a real composition, we could have melodic variations and ever changing harmonic series to match each melody segment. Harmonics 1 to 6 are equivalent to a C major chord. Seen from that area, it seems that only consonant harmonies issued from the major scale should fit; this is subjective, it depends in reality on our perspective. With harmonic 7 it becomes a C7 chord, still major but now more dissonant and yet, also allowing new extra notes, away from the major scale. Harmonics 8 to 13 contain a whole tone scale (with an extra note). We are now entering a more dissonant territory. Again, this is relative to our point of view since in itself, this area has an interval symmetry, which makes it harmonious in its own way. From harmonic 14, we start to move chromatically and add all of the existing notes. By the time we reach harmonic 27, we obtain the note A, which completes our twelve notes system, entering now a very dissonant area. This is the point of view of all the notes, as used in serialism and atonality. Musical Fractal dimensions – The consequences are that many views are possible and from each perspective, various concepts of how to organise harmony may be deduced. Accessing all views at once, we obtain the capability to zoom in and out, change ‘worlds’, find connections and use different rules such as exclusive/inclusive, micro/macro, going from order to chaos and back.As I was looking for the best way to ‘harmonise’ all the possible notes, I imagined different inter-connected areas which may become accessible by changing point of view. The rules and concepts for each region are just a convenience construction to hold a view, which reminded me of the various patterns and regions that compose a Mandelbrot Set. Serial Music is generally conceived as an ‘horizontal’ progression and as a result, ‘vertical’ harmony is left to the polyphonic encounter of several voices moving forward ‘horizontally’. The technique described above can be useful as an attempt to create ‘harmonic’ twelve tone music that ‘works’ horizontally, vertically and in diagonal.